When people ask me who my influences are as a singer, I don’t think they expect my first answer to be Iron Maiden’s Bruce Dickinson. The first time I heard Iron Maiden, it was something like 11:30 on a Sunday night in 1982. I was living in Vancouver, BC, and listening to a radio show that played imported heavy metal records. The song had just been released. It was called Run to the Hills [click for song]. It was like nothing that ever existed before. To me, as a singer, Bruce Dickinson is the The One. How do I even describe his voice? It’s the perfect voice, to me. Pitch, perfect. Tone, perfect. Powerful. Dramatic. Big. It resonated strongly with me, from the first time I heard it. I was gobstruck. I could only hope to ever be such an incredible singer. The String Quartet Tribute brought home to me how akin really good metal/progressive music like Maiden’s is to classical music. I guess that’s why Bruce Dickinson, with his huge, dramatic tenor voice, is such a perfect fit with Maiden. The whole thing works together, and it’s brilliant. It really came to my attention when I was listening to some of Maiden’s newer music. I have to say, as much as I love me some classic Maiden (I got to see them way back on the World Slavery Tour), I love their newer music even more. I pulled this song up for my mentor one day, trying to illustrate the “classical music” point to him. “Listen, it’s in 3/4 time.” And he counted it for me: one-two-three, one-two-three…a heavy metal minuet. I was astounded. My weird, brief stint as a karaoke host led me to try unusual things on stage to keep myself entertained, and to find out what I was capable of without a guitar. One of the first things I tried was, of course, Iron Maiden. And I had a hard, rough time with it. But that secret desire to actually SING Maiden pushed me to keep at it at home. I discovered what’s different about singing Maiden from most of the other music I sing: it requires the entire lung. Where you have to get down low in your lungs and diaphragm for most singing, singing like Bruce requires it ALL. It is a full body experience to sing Maiden! And I mean that. You really have to make your torso muscles work hard, and you have to move to do it. I first started really getting it right when I carried a pair of ten pound weights around the Treehouse while I practiced. I moved in whatever way felt natural to getting the song out, and with the extra tension from the weights, felt the muscles that were needed to do it. It was an amazing learning experience. I urge anyone who wants to build singing strength to try it! That was also the summer I became able to sing songs I never thought I would be able to sing: Barracuda, Man on the Silver Mountain, Immigrant Song, Sweet Child of Mine, and many more. I think singing while you are physically active is a good way to build vocal strength and breath control. I don’t mean shouting out a Maiden song while you are jogging! You don’t want to strain your vocal cords. But doing something physical seems to make a big difference. And really, that’s a lesson that goes all the way back to Bruce Dickinson. Look at the man. I mean, LOOK at him. Have you REALLY looked at him, RUNNING around stage and LEAPING all over the place while he is singing? He is one fit dude. Not to mention a world champion fencer. 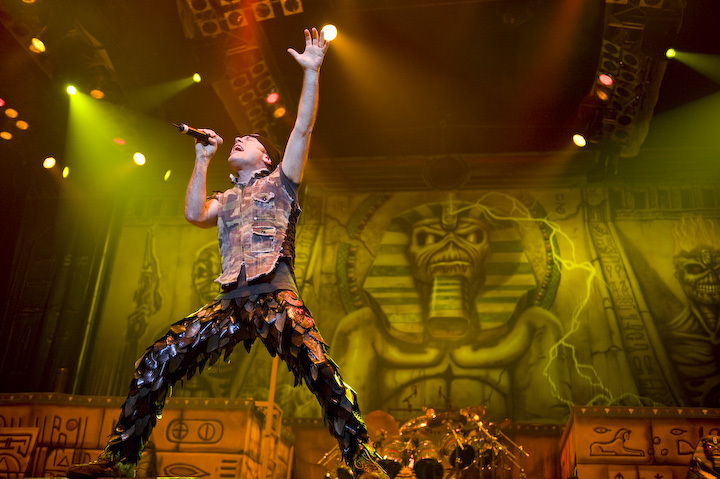 To me, Iron Maiden is as much a modern evolution of classical music as of rock and roll. Their songs are brilliantly played, orchestrated precisely and even broken into musical sections, then overlaid with the most beautiful dramatic tenor around, singing (and acting) a well-written story for the thinking listener. If there’s one thing most metal fans can agree on, is that Iron Maiden is one of the very best bands there is, bringing the very best music to the world. And it’s no surprise that, with pretty much no radio play, they still have a mondo-huge following of people of all ages, from all over the world. There is a Maiden cult, and I’ve been a proud member for 31 years. By the way, if you haven’t done so, check out the Canadian-made documentary on Iron Maiden, Flight 666. It’s possibly one of the most interesting videos ever, even if you’re not a metal fan. (But I might be biased.) Also, Bruce Dickinson? The singer? Also flies the plane. If you have the time, check out these two other favourites of mine from Anatomy of Evil: Wasted Years and Run to the Hills. Also check Scott Lavender: the Piano Tribute to Iron Maiden.